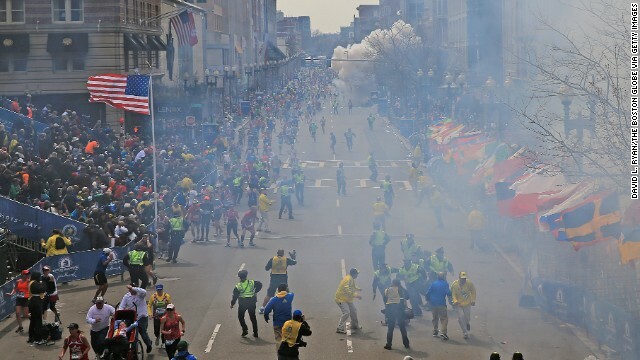 Washington (CNN) - It's rare to find an issue on which Democrats and Republicans agree, but according to a new national poll, they see eye-to-eye on how the Boston Marathon bombing investigation was handled. An ABC News/Washington Post survey indicates that two-thirds of Americans approve of how the federal government investigated the bombings. The poll's Tuesday release comes on the first anniversary of the attacks near the finish line of the marathon, which killed three people and injured at least 264. According to the poll, there's no partisan divide, with three-quarters of Democrats and more than six in 10 Republicans and independents in agreement. In a separate question, 58% say they have a favorable impression of the things the U.S. government's doing to try and prevent terror attacks here at home, with 38% saying they have an unfavorable view. The survey suggests a partisan divide on this question, with 72% of Democrats but just 54% of independents and 49% of Republicans saying they have a positive view of Washington's efforts to stem terrorism here in the U.S. Within a couple of days of the bombings, investigators identified two suspects. We later learned that they were brothers - 26-year-old Tamerlan Tsarnaev and 19-year-old Dzhokhar Tsarnaev - who emigrated from Russia to the U.S. A few days after the bombings, there was a carjacking and a shootout with police, where the older brother was run over by the younger brother as authorities tried to handcuff him. He later died from his injuries. A city went on lockdown. A badly wounded and bloodied Dzhokhar Tsarnaev was apprehended in nearby Watertown, Massachusetts following a manhunt. He awaits trial in November. Federal prosecutors say they'll seek the death penalty. This year's marathon is set for this upcoming Monday. Maybe next time the Russians tell the FBI to take a close look at some people, they will not only talk to them, but actually do some watching and listening. Well, I would hope everyone would agree on this topic. It's a sort of good thing the GOP gets behind the U.S. when there is a terrorist attack in Boston. Meanwhile, their TEA Party schlock troops are working a secession bill in Wisconsin (really?) that will likely fail as did the same effort in Texas. How un-American can you get? Naturally today the House wrangles a bill to prevent Presidents from ever declaring federal land a national park or monument (hello, you guys ever hear of Theodore Roosevelt, the last great GOP President?). This probably over the "harassment" of a wealthy rancher in Nevada who failed to pay his grazing bills for 20 years to let his cattle lose on OUR federal lands in Nevada- oh, yeah. Let me guess- that's one law the GOP didn't want to be enforced, right? Because that sort of "corporate welfare is good. right? I am sure it was that and their desire to sell off as many leases on federal land so the Kochs can mine, pump, sink wells, frack and otherwise destroy OUR property. At least we agree on Boston. That incident should NEVER have occurred, in the first place. That much is perfectly clear........the Obama regime FAILED to protect our country from that attack........in spite of all of their spying........because they were spying NOT to protect us, but rather, for political purposes. "Meanwhile, their TEA Party schlock troops are working a secession bill in Wisconsin (really?)" What's it called? The Take My Ball and Go Home Bill? Maybe the The Country Is Too D-mn Brown Act? yeah, yeah, yeah. "Too much spying, too much security". You Righties crack me up. Do you really think there was anything that would have stopped this attack in the fact of the Right's hatred of the federal government? Every time one of these things happens, it always comes out that somebody failed to "connect the dots". You'd think by now, 13 years after 9/11, we would have a government that has learned how to connect the dots. Slow learners for sure. Sure, because like this stuff happens everyday, everywhere. If you know so much how come you didn't stop it? rs, Tommy was busy explaining the theory of relativity. "wealthy rancher in Nevada who failed to pay his grazing bills for 20 years to let his cattle lose on OUR federal lands in Nevada"
Women = human shields. Know who else does that with women and innocents...and for precisely the reason that undereducated numbnut in Walmart fatigues just stated? Anyone wanna take a guess? Go head...guess. Have you seen her interviews? How about the investigative reports(?) she did. Face it, coming from the gene pool she did, you'd think there might be more there, than is. She needs to stick to basket weaving. She doesn't have what it takes. I wonder why only half of the Republicans polled have a positive view of what the government is doing to prevent another terrorist attack. Do they all of a sudden have a problem with torturing terror suspects? Are they all pulling a Rand Paul and believing drone attacks are unconstitutional? Are they actually concerned about the NSA spying on American citizens despite voting for representatives who think there's nothing wrong with that? Or are some of them concerned that we're not doing enough? ...except Rand Paul who probably thinks a bombing is wrong but the federal government shouldn't stop a person's free expression of bombing.